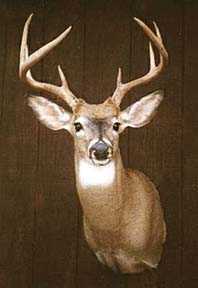 Quality Wild Game Processing for over 50 years, we do this the "Old World Way"
Let Bavaria Turn Your Game Into a Flavorful Delicacy! Please Note: We will only accept CLEAN and LEAN meat - Absolutely No BONES or Excessive FAT or Tallow. WE CAN ONLY MAKE GOOD SAUSAGE FROM GOOD CLEAN MEAT!! The products in this category are NOT FOR RETAIL SALE and are displayed solely for the educational purposes of customers wishing to have CUSTOM MADE PRODUCTS processed from their own Venison & Wild Game. 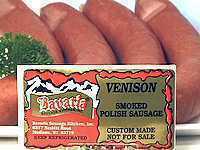 Bavaria Sausage has been in the processing business for OVER 50 years; Hunters from all across the U.S. have been shipping and bringing in their Boneless Venison, Elk, Caribou, Moose, Bear, etc., to have a Superior Quality Product produced. 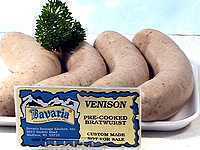 Bavaria Sausage is NOT a locker plant. 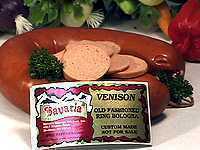 We are a FEDERALLY INSPECTED German traditional Sausage Kitchen.We make your products the old fashioned European way, the way it should be made! We use only fresh lean meat in all of our products. We do NOT use any fillers, additives, by products, artificial colors, Gluten or liquid smoke--NO MSG--EVER, PERIOD. The products we produce are pure and delicious! All of our products come professionally and individually labeled and air-sealed, boxed 'ready for your freezer. Most of our products average about $3.09 per lb. finished product. NOTE! We can't finish your order in 1-4 weeks!! We are extreamly busy-and quality takes time! You must allow 2-4 months!! If you have any questions about our venison, elk, bear or other wild game processing, please feel free to call us with your concerns at 1-800-733-66951-800-733-6695 or use our Contact Form to send an email with your comments. The following products are examples of the finished product when we process your wild game. They will come vac-sealed, labeled and ready for the freezer. Average price of $3.06 lb. Some products have extra charges. Very Lean, all natural spices, hickory smoked and natural spices. (NO MSG!). 18 oz. Air-sealed stick. If you enjoy just a touch more Garlic then this is the Sausage to try! You can take the plastic wrap off and let lay in the fridge. They will age and dry! Made with Red & Green Brazilian Peppers added for that extra flavor and spice. 'Great tasting, yet NOT hot! No fillers, additives, water or MSG is ever used.18 oz. Air-sealed Stick. You'll definitely want to try this one! 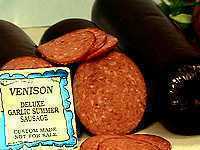 Smoked Cajun Venison Summer Sausage- DISCONTINUED!! 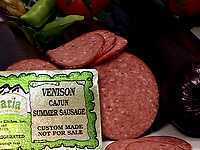 Hot & Spicy Cajun Seasoned Venison Sausage! Made with just the right amount of Red Wine for that Extra-special flavor. If you like it HOT, then this is the sausage for you. 'Can be sliced and grilled for something different! 18 oz. Air-sealed Stick. 10 oz. Venison Sausage Chub basted in Honey Mustard and special spices! Double Hickory Smoked for that added natural smokey flavor. Number 1 requested item for Party Hors d'oerves and slicing for subs and sandwiches! Something fun and different for your guests! 1 lb. average stick NOT Air-Sealed. This is a natural casing summer so that you can age this as hard as you like for more flavor and great taste! 'Just hang this in a cool place to air dry and age. The more you age it the more the spices will come out!. 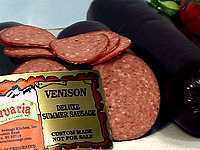 If you like aged dried summer sausage, you will love this one! 1 lb. average Air-Sealed Ring. Another BIG favorite that is most requested! Fully cooked. Just heat and serve to compliment any meal--OR--try it cold, grilled, or steamed. Excellent quick meal when served with fried potatoes! Very Lean & Hickory Smoked. 4-5 Brats per 1 lb. vacuum package. 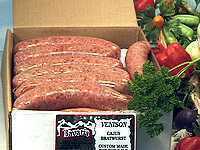 These brats are fully cooked and ready for the grill, frying pan or cut up into your favorite soup, salad, or casserole hot dish! Brat Reuben: Grill or Fry, Butterfly the Brat open, Serve on a Hamburger Bun with Sauerkraut and Swiss Cheese--. 4-5 Brats per 1 lb. Vacuum-Sealed package. Fully cooked and Grill Ready! Or can be used to spice up soups, salads, and any favorite Hot dish. These are especially made for those of you who LOVE Garlic! 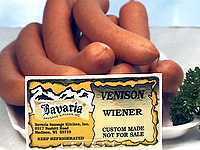 Fresh Bavaria Venison Bratwurst- DISCONTINUED! This is a RAW PRODUCT. These are boxed BULK in 6 lb. boxes. (NOT cry-o-vac packaged!) Approximately 27 to 30 pieces (brats) per box. These are a fresh, traditional, German Bratwurst. Made only with Lean Meat and Natural Spices. (NO MSG!) Par-Boil in Beer & Onions and Grill or Fry them! A TRUE Party Brat. 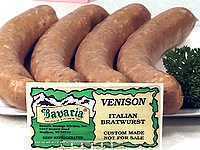 Fresh Italian Venison Bratwurst- DISCONTINUED! This is a RAW Product. 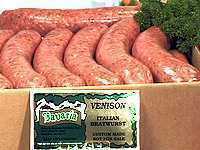 Our Fresh Italian Venison Bratwurst come Boxed BULK in a 6 lb. box. (approx. 27-30 pieces per box). Great Zesty Italian flavor--perfect for grilling, or to be used in your favorite Italian dishes...Spaghetti, Lasagna, Manicotti and more! ('just slit the outer casing, peel, and crumble for most hot dishes). 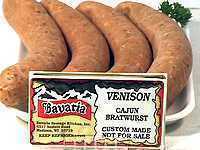 Fresh Cajun Venison Bratwurst- DISCONTINUED! This is a RAW Product. Boxed BULK in a 6 lb. box. 5 brats to the lb.These are for the 'HOT n SPICY' lovers! Great for the grill or try it in your favorite Southern Hot dishes--Jambalaya, Dirty Beans & Rice and more! 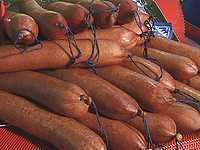 The spices used in these Bratwurst is equivalent to "Andouille" as is used in many HOT Favorites! 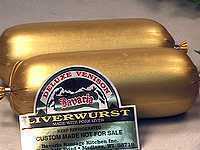 4-5 bratwurst per air sealed package. These brats are fully cooked and ready for the grill or frying pan. Also great cut up in Italian sauces and pasta dishes. Not hot, but spiced just right!! 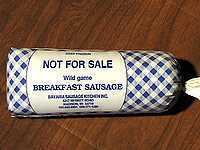 Pre-Cooked Cajun Venison Bratwurst- DISCONTINUED! 4-5 brats per air sealed package. Great for the grill or southern style cooking. A super spicy favorite equal to Andouille sausage. If you like spicy hot, you will love our Cajun!!!! 8 to 10 wieners per cry-o-vac package. (Air-sealed for freshness). Mildly spiced and the whole family will just love 'em! 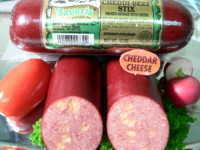 We use our special German seasonings to give them that "Old World Goodness" and that "Old-Fashioned wholesome Flavor". This is a super good Bratwurst!! 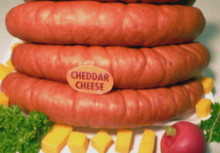 Our cured and Smoked Brat filled with creamy cheddar cheese. This bratwurst does have a tougher casing because it is smoked. They "crack" when you bite into them. We vac. sealed and ready for the freezer. 4-5 bratwurst per lb. Extra charges to apply for the cheese. 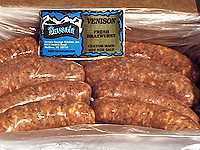 Our Venison Breakfast Sausage is mildly spiced and perfect for breakfast patties! Packed in 1 1/4 lb. bulk plastic packages -- great size for most family breakfasts! Makes great breakfast sandwiches, too! Great to take camping, too. 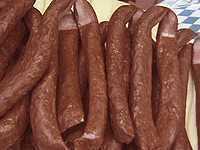 A Super CREAMY liver sausage. Packed in 1 lb. vacuum stuffed tubes. 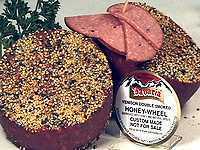 Mildly spiced and super creamy "Braunschweiger" This is sure to be a big hit for those who love liver sausage!! Ship us your Venison and try some! Comes by the pair. They are about 6 inches long each. Made with red and green Brazilian peppers. Spicy but not hot. A little something different in a snack stick! They come 50 pair to a box. Cryo, 10 pair per unit. Freeze, then take out what you need, and age on a hanger. The harder they are the more spicy. 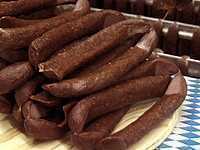 A super lean, meat snack stick that is super hot n' spicy. They come in a pair, about 6 inches long each. 50 pair to a box, cryo 10 pair per unit. You have to love Cajun to love these!! Freeze, then take out what you need and hang on a hanger to dry. the harder the more spicy they are. Extra charges do apply. Made from your own very lean venison, plus lean cuts of pork and beef. 'Very mildly spiced. Just heat and serve over mashed potatoes or noodles, or use for Sloppy Joes or chilly. A great Tasting easy meal. Shelf-stable and thus does NOT take up room in your fridge or freezer! Best kept in a cool dry area. Average 2 lb. Jar. Extra charges do apply for the jars. Our Venison burger is Excellent!! Super lean, like ground chuck. Mixed with beef and pork and vacuum stuffed into 1-1 1/2 lb tubes Keeps 1-2 years in the freezer. NO SUET is ever added to our burger. Average price is around $2.75 lb. 4 patties to the lb. 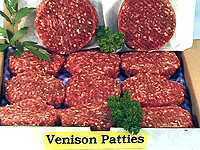 Very lean venison burger patties. ready for the grill or frying pan. Packed bulk in 10 lb. boxes. Great for Summer cook-outs! 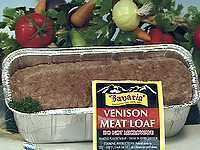 Venison Deluxe Meat Loaf- DISCONTINUED! 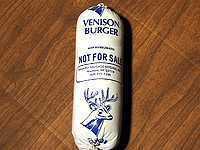 The venison products average about $3.09 lb. A few of the products will have separate charges. Landjagers run you 1.06 cents a pair or 52.75 per box of 50 pair. These are now cry-o-vac 10 pair per cryo unit. Page Summary: Quality Wild Game Processing for over 50 years. 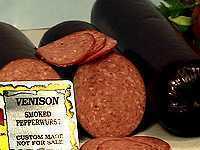 Products include Venison Summer Sausage, Ring Bologna, Bratwurst, Wieners, Breakfast Sausage, Liver Sausage, Landjaeger, Canned Venison and Venison Burger.